Effects from not drinking water are pretty bad. Digestive, skin,bladder and kidney problems, fatigue and headaches, these all happen when you don’t drink enough water, we need water like we need air to breathe. 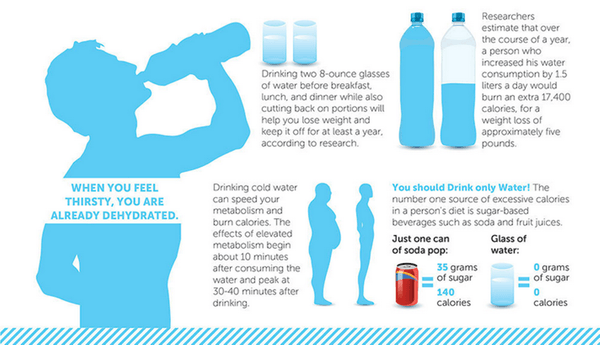 Keeping your body hydrated is no joke! Dehydration kicks in just before you start feeling thirsty, that is why it is recommended to drink water throughout the day, make sure you have a bottle or a glass of water with you at all time, and don’t tell me ” I’m not a morning person. I don’t drink anything. “ have two glasses of water when you wake up, this will boost your blood pressure to normal levels and it’s way healthier than having your first cup of coffee on an empty stomach. Many believe that to stay hydrated all you need is to drink something every now and then. doesn’t matter if its sweetened juice or soda or tea, this is wrong. It’s actually the opposite, to deal with the excess sugar and salt you put inside of you your body waste a huge amount of water just to clean your system , if you love coffee so much, make sure to drink an extra cup of water for every coffee you have. Drinking water will speed up your metabolism and will make you feel more ” full ” you will eat less once you start drinking more water.